Some of Queensland’s leading women engineers, medical practitioners, scientists and science teachers will join discussions today (Monday) about the problem of gender equity in science, technology, engineering, maths and medicine (STEMM). Discussions will focus on why successive generations of clever, well-educated women in STEMM have trouble reaching senior levels in their field and often leave their profession early, and how this affects career choices. The sold-out event will be hosted by Women in STEMM Australia as part of National Science Week. Minister for Innovation, Science and the Digital Economy Leeanne Enoch – who will be delivering a speech ahead of this afternoon’s panel discussion at Queensland Museum – said gender equity in these fields was not simply a question of fairness but an economic imperative. “We can’t afford to educate women to post-graduate level and then see them leave the profession. We need to draw on our entire pool of STEMM talent to get the best outcomes and ensure we have enough of the workforce we need,” Ms Enoch said. Ms Enoch said a University of Melbourne science workforce report in 2015 found women outnumber men in many universities in Australia, and although more than half of all undergraduates and PhD students are female, they comprise just 17 per cent of senior academics and top-level professionals. 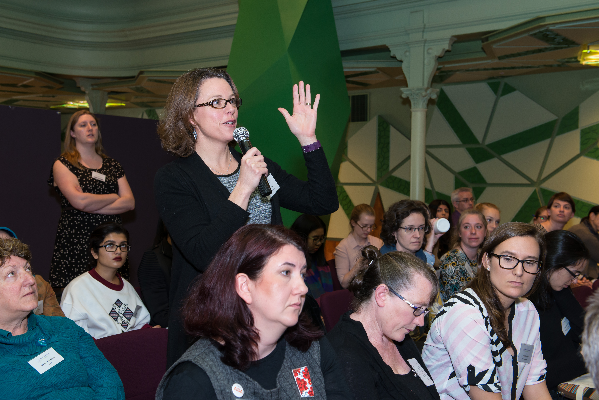 “National Science Week is an opportune time to address systemic issues facing women in STEMM fields and to put a spotlight on the marvellous work women are doing in laboratories, classrooms and in the field right across Queensland,” Ms Enoch said. “Women who are passionate about cancer research, physiotherapy, astrophysics, drones and robots, and many other fields in which Queensland women excel, can smash stereotypes and turnaround opinions about STEMM as an exciting and viable career for women. “They can greatly influence girls at critical stages, such as when their interest in doing maths and science wanes, or when they’re deciding their future career,” she said. Dr Marguerite Evans-Galea, Co-founder and CEO of Women in STEMM Australia, said her organisation was delighted to host this event in Queensland, which has such a large and amazing talent pool across science, technology, engineering, mathematics and medicine. “This event not only provides a great line-up of diverse and talented speakers to discuss these vital equality issues and key decision points for girls and women, but it is also an outstanding networking opportunity for everyone – women, men, everyone,” she said. Ms Enoch said the Palaszczuk Government has introduced programs like the Advance Queensland research fellowships and PhD scholarships and supported 158 women researchers through the Women’s Academic Fund in a bid to break down obstacles to career progress. “We’ve also supported events that allow girls to meet women who are STEMM role models as well as many other activities like coding and robotics competitions that can spur girls on to study these areas and build their confidence with technology,” she said.